Hilton Head Island Maps - Guide to local attractions and Hilton Head plantation resort areas, including Hilton Head Plantation, Palmetto Dunes Plantation, Port Royal Plantation, Sea Pines Plantation, Shelter Cove Marina, Shipyard Plantation, Daufuskie Island, and Hilton Head Parks. Guide to local attractions, restaurants, accommodations and entertainment on Hilton Head Island, SC. You'll need a sense of adventure and a love of nature, plus a handy map or two to point you in the right direction! 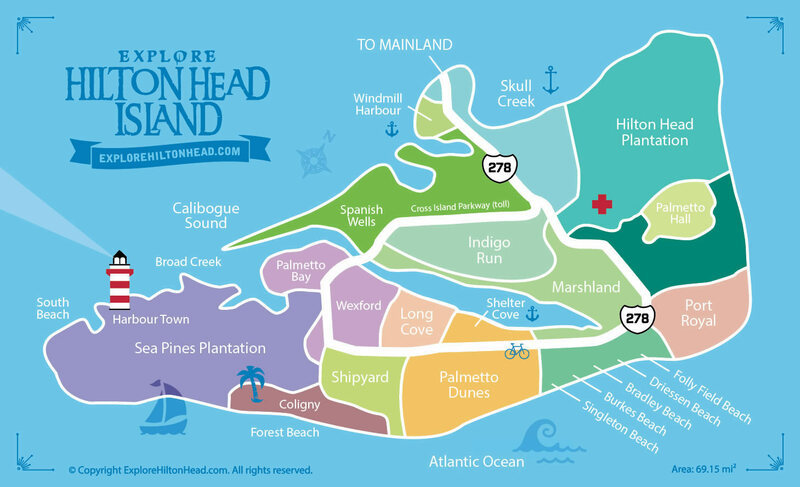 We've compiled a complete directory of illustrated and interactive maps to local attractions and Hilton Head plantation resort areas, including Hilton Head Island Plantations & Resort areas, Hilton Head Bike Paths, and Hilton Head Parks. 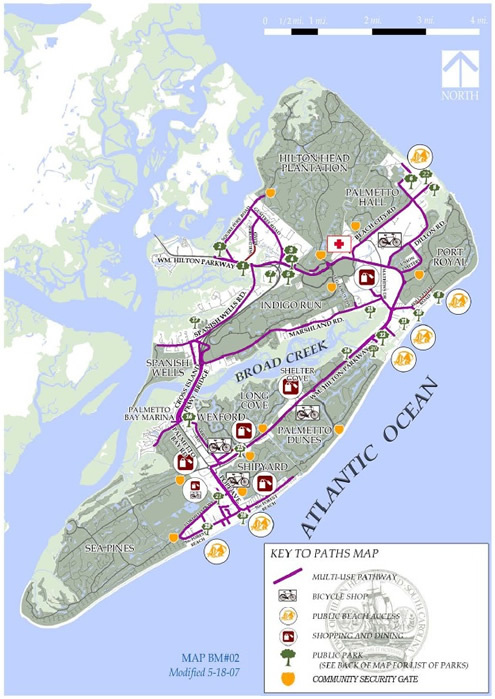 The main island resort areas consist of Hilton Head Plantation, Palmetto Dunes Plantation, Port Royal Plantation, Sea Pines Plantation, and Shipyard Plantation. There's something for the entire family in Hilton Head, and the Lowcountry Lifestyle will charm you with its friendly people, places and smiling faces! Popular entertainment destinations on the Island include Coligny Plaza, Shelter Cove Marina, and Harbour Town. Hilton Head also has several movie theaters, nightclubs and lounges. With more than 50 scenic miles of public bicycle paths and trails, as well as wide, expansive beachs, bicyclists can explore the island in a safe and enjoyable environment. Bike riders should always be mindful of vehicular traffic and obey all traffic signs and laws, and be courteous of pedestrians and crosswalks. Hilton Head Island leadership also plan to build additional pathways to link community parks and major activity centers. The hard-packed beaches are also popular for bicycling at low tide. Bicycle rentals are available island-wide throughout the year. One of the best ways to explore the natural beauty of Hilton Head Island is by hiking or backpacking and traveling along the Island's splendid nature trails and coastal regions at your own pace. Wind past creeks, lagoons and rivers as you glimpse the Lowcountry's unforgettable scenery. 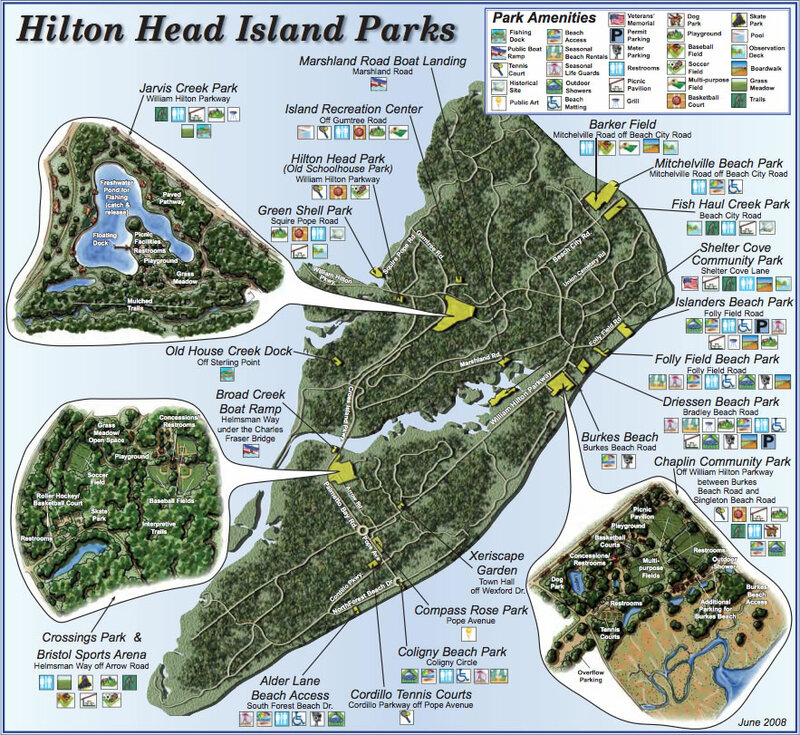 » Click here to download a printable map of Hilton Head Island Parks and Recreation Facilities. South of Palmetto Dunes is Shipyard Plantation, which contains the Crowne Plaza Hotel. Port Royal Plantation holds the Westin Resort and two Marriott timeshare properties. Hilton Head Plantation has access to the famous 12 mile Hilton Head Beach, although technically it faces Port Royal Sound instead of the Atlantic Ocean. There are rental properties, however, many of the residences are used as primary or secondary homes and are not on the rental market. Located mid-island, Palmetto Dunes Plantation blends serenity with amenities, creating a perfect island experience. This 2,000 acre oceanfront resort borders uncrowded beaches on one side and gives access to Shelter Cove Marina by biking under the highway on the other side. The 11 mile lagoon system welcomes you to enjoy the island's wildlife in its natural habitat by fishing, canoeing, kayaking. Try one or all three of the championship golf courses or pick up a racquet at the Palmetto Dunes Tennis Center with 23 clay and 2 hard courts. Palmetto Dunes hosts fine dining restaurants as well as easy access to Shelter Cove Marina. Here you will find shops, more fine restaurants, and live entertainment. Need a new swimsuit? Shelter Cove Mall is right outside the gate with many stores to fulfill your every desire. Port Royal Plantation is home to several world-class Hilton Head resorts, including Port Royal Golf & Racquet Club, and Marriott's SurfWatch, which is a laid-back hotel with a private beach area and dining, plus indoor, outdoor and saltwater pools. Located at the southern tip of the Island, Sea Pines is abundant with natural beauty and scenic areas to Explore. Walk or bicycle through 5 miles of sandy beaches, or hike the 600-acre nature preserve filled with lagoons and forested woodlands, or Explore the storied Baynard Cove Ruins. 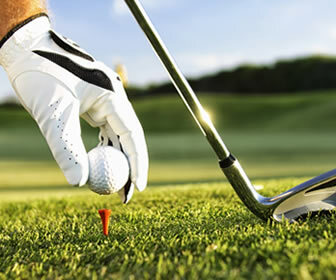 Sea Pines is also the home of the Verizon Heritage Golf Tournament and Family Circle Tennis Tournament. 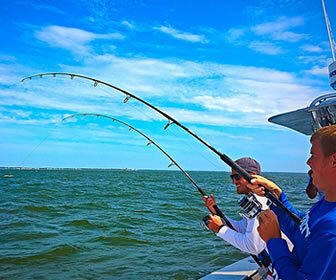 Whether your passion is Bicycling, Sailing, Kayaking, Fishing, Tennis, Crabbing, Parasailing, Jetskiing or swimming, Sea Pines offers something for everyone. Shelter Cove Marina is one of the finest ports of call on the East Coast. It's also a great stop for sampling the many resort luxuries of Hilton Head Island and Palmetto Dunes Resort. When you dock at Shelter Cove you are extended privileges and preferred rates at the 1,800-acre Palmetto Dunes resort community. The Marriott hotel and Disney Vacation Club, 3 championship golf courses, the acclaimed PD Tennis Center, miles of beach and dozens of shops and restaurants – all located within a two mile radius. The smallest of the resort plantations, Shipyard is located between Sea Pines and Palmetto Dunes Plantations. Shipyard Plantation is home to a splendid environment with abundant natural beauty and activities to entertain. Shipyard borders the Atlantic Ocean with 12 miles of white sandy beaches. Bike paths are cloaked with tapestry of live oaks, tall pines, and spanish moss. A maze of lagoons and lakes beckon the fisherman as well as deer, egrets, herons and alligators. Tee up at the Shipyard Golf Club or improve your game with a lesson at the Hilton Head Island School of Golf (located in Shipyard). If tennis is your game, Shipyard Racquet Club has 20 courts ready for you. Daufuskie Island is the southernmost barrier island in South Carolina, and is located between Hilton Head, South Carolina and Savannah, Georgia. The Island can be accessed only by passenger ferry or private boat. The Island has a rich history, most recently as the site of Pat Conroy's teaching experiences that were the basis of his first novel The Water is Wide and the motion picture Conrack. Daufuskie Island is now home to about 200 permanent residents and offers an uncrowded, slower pace of life. Golf cars are a primary method of transportation on the Island's sandy roads, which do not have a single stoplight. Two private clubs offer world class golf, tennis, horseback riding and many other activities for both adults and children. Daufuskie Island is a unique vacation getaway in the Low Country of South Carolina. Located at the southern part of the Island, Forest Beach is a non-gated community that stretches along the Atlantic Ocean. Forest Beach is alive with natural splendor and a host of amenities. Miles of white sandy beaches offer visitors panoramic vistas and an expanse of coastline left relatively untouched by man. Two-wheeled adventure awaits you with public bike paths up and down North and South Forest Beach. Fun spots include miniature golf, Waterfun Park, and Van der Meer Tennis Center: Coligny Plaza. Coligny Plaza is significant in carving the Islands history. Today, that charm continues to create more historic moments. Enjoy island shopping, dining, nightly entertainment, all at an island's pace. If you like to lay out on uncrowded beaches or enjoy a secluded area, Folly Field is calling out to you. This area is located at the northern part of the island and makes a great getaway for couples and Families. Enjoy the sandy shores of the Atlantic or rent a bike and explore the island. Restaurants and shops are close by at Shelter Cove Marina or travel off island to the outlet stores for a day of sensible splurging. Are the kids looking for some fun? Try out adventure Cove on Folly Field: batting cages, bumper cars, lazer tag, mingolf, and a driving range.